1) Start a book discussion group. Have your team read a chapter of the book each week and use our questions to get the conversation started. 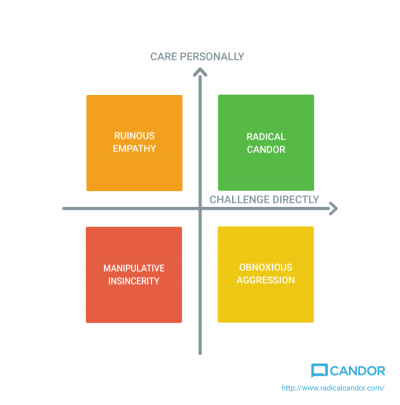 2) Print the Radical Candor framework. Put up the printouts in conference rooms, 1:1 rooms, or wherever your team will see it regularly. Having the ideas top of mind can help when a feedback situation arises. 3) Share your own stories. Think of your own stories in each quadrant and share them with your team. When did somebody give you some Radically Candid feedback that maybe stung a little bit in the moment but stood you in good stead for the rest of your career? 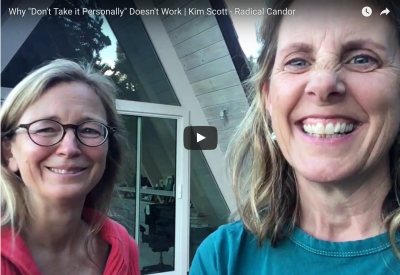 For more ideas, read about this company who created a Radical Candor award. What other things have you and your team done to get started with Radical Candor?